You are currently browsing the category archive for the ‘Prophet sallaAllahu alayhi wasalam’ category. 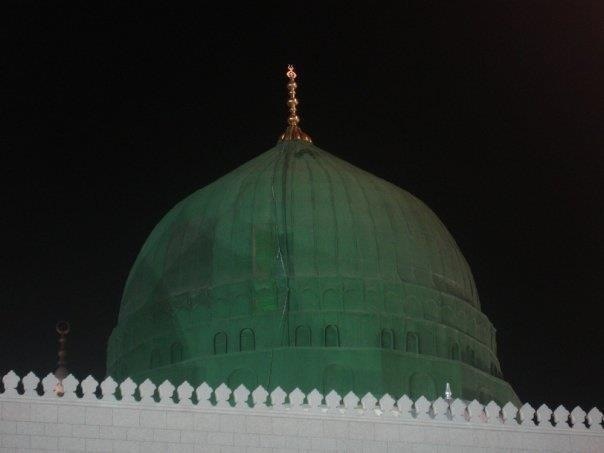 The Green Dome of Felicity. Underneath which the beloved rests. Endless peace and blessings be upon you oh beloved of Allah! The piece presents itself as a ‘cloud’ almost. This is a reference to how the clouds shaded the Prophet Alaisalam. The centre name ‘Muhammad’ is covered in mesh known to artists as ‘angel hair’. Here, one of the references is to the fact that the name of the Prophet is written on the eyes of angels. 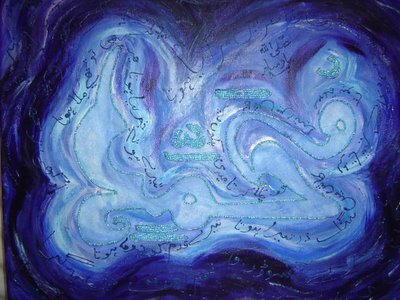 The name of the piece itself ‘The Beloved’ is a reference to how there were titles associated with the Messengers of God; for instance Prophet Ibrahim Alaisalam is known as ‘The Friend of God’. This title shows the unique status of the final Messenger as the Beloved of God Himself. In line with most Tranquilart work, the theme of change is reflected in the piece through colour. The shades of light and dark paint depict our spiritual transcendances in this world. The darker shades represent the chaotic life of a spirit in search for peace, meaning and depth. The lighter shades represent the goals acheived once the being sets out looking for change. I have always affirmed that Tranquilart is about change. 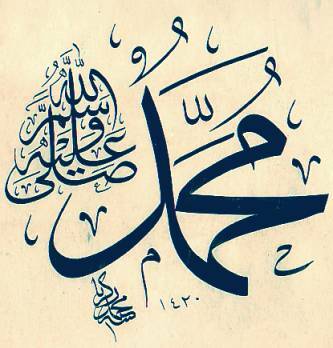 Here, the name of the Prophet indicates that he is the light guiding the spirit towards the harmony it desires. Tere dehleez par kara hota. On your doorstep, would he have stood . The reason for using an Urdu poem is reflective of Identity as a Muslim woman born and living in England. Neither myself, nor most of my siblings learnt to read or write Urdu as a child. I never really thought I would need it. As an adult I learnt to speak Urdu in the various environs I found myself in. My use of the Urdu poem in the piece reflects my own search for identity; my mother-tongue is a dialect of Punjabi and thus not a ‘recorded’ language – this makes Urdu the closest written language to my roots. Fusing the Arabic, English and Pakistani allowed me to demonstrate that the Message of the Prophet was not limited to one nation or time. Finally, the piece was one of the first pieces which I did mostly without the aid of a paintbrush. The main process has been painting with my fingers directly and this was then aided with the beadwork. Each bead has been taken individually by my fingers and stitched into the canvas. The entire process was extremely peaceful and encouraged me to ponder deeply into the title: The Beloved. © Taslim Rashid has contributed this beautiful article to the Light Reflections series on Healing Hearts. The article was originally published on her awesome blog back in 2004. The battle was over. On that solemn day, the Ummah of our beloved Prophet Muhammad (may the peace and blessings of God be upon him) was decreased by about seventy of some of its greatest members. The Prophet (may the peace and blessings of God be upon him) lost not only many of his close companions, but his precious uncle as well. Hamza (Allah’s blessings be on him), who supported the Prophet (may the peace and blessings of God be upon him) during his difficult years in Makkah, aided and protected him on and off the battlefield, and was a close mentor and friend, was martyred. Hamza (Allah’s blessings be on him), one of the dearest people to the Prophet (may the peace and blessings of God be upon him), was killed on the battlefield by Wahshi Ibn Harb, an Ethiopian slave. Years later when Wahshi would become Muslim, the Prophet (may the peace and blessings of God be upon him) accepted him, but asked him to stay away, as the memory of his uncle continued to remain too painful to bear. This illustrates the deep love the Prophet (may the peace and blessings of God be upon him) had for Hamza (Allah’s blessings be on him), and how difficult the loss must have been for him. When anyone of us is faced with such a dismal condition, it becomes exceedingly difficult to remain optimistic. We all know that optimism is highly encouraged in our deen. We are told to remain hopeful until the very last breath for the mercy and forgiveness of Allah. It is easy to be optimistic during times of blessing and plenty, but during times of hardship and distress, optimism is the last thing on one’s mind. However, it is during times of misfortune that being optimistic really bears its fruit. The Prophet (may the peace and blessings of God be upon him) was a master of remaining optimistic during times of difficulty. No matter how troubling the situation was, he would always find a way to encourage his companions to look at the bright side. After the Battle of Uhud, during this difficult moment in the Prophet’s (may the peace and blessings of God be upon him) life, one would expect perhaps an inkling of negativity, or of hopelessness. However, when Abu Sufyan climbed over the mountain after the dust of the battle settled and shouted, “The luck of war alternates. One wins today (referring to the Muslim victory at Badr), one wins tomorrow. Show your superiority, Hubal!,” The Prophet (may the peace and blessings of God be upon him) swiftly responded, “Allah is the most High and Majestic. We are not the same. Our dead are in the Garden of Paradise and your dead are in the Fire!” SubhanAllah, even at this dreary moment in his life, the Prophet (may the peace and blessings of God be upon him) used his optimism to completely turn the tables on the Quraysh. What would have perceived to any onlooker as an obvious loss to the Muslims, the Prophet (may the peace and blessings of God be upon him), with the right frame of mind, turned into a clear victory. Optimism is therefore a picture of the state of one’s mind. No matter what happens in the outside world, it cannot harm or hurt you, if you have the right mindset. That is exactly what optimism is all about; to have a positive outlook during any occurrence in life, and the Prophet (may the peace and blessings of God be upon him) was the master of staying optimistic. If he had not remained so, there was no way that his companions could have had the everlasting willpower to continually beat the odds and spread Islam all across Arabia and beyond. This lesson from the life of the Prophet (may the peace and blessings of God be upon him) can be applied to our lives every single day. Whenever Allah tests us with some calamity or hardship, always remember that at the end of the day, alhumdulillah, you are Muslim, and that’s really all that matters. This is what the Prophet (may the peace and blessings of God be upon him) did when faced with those who stated that he and his companions were defeated. He knew that despite their passing, they were believers, and as such, their reward is in the Hereafter, whereas the survivors amongst the Quraysh may live for a while longer, but would then suffer the eternal punishment of the Hellfire. He did not view the outcome of Uhud as having lost seventy of his companions in this life, but as gaining seventy companions to be with him in Paradise. We should be encouraged to constantly stay positive in the light of any circumstance that may come our way. It reminds me of another beautiful hadith of the Prophet (may the peace and blessings of God be upon him): “Wondrous are the affairs of a believer. For him there is good in all affairs, and this is so only for the believer. When something pleasing happens to him, he is grateful, and that is good for him; and when something displeasing happens to him, he is patient, and that is good for him.” (Muslim). Therefore, no matter what happens in your life, whether perceived as good or bad, in the end it is good, if you hold fast to your Islam and remain a firm believer in Allah and His Prophet (may the peace and blessings of God be upon him). You just have to be optimistic. A gentle reminder to those who think they may have it bad; the best of all creation sallaAllahu ‘alayhi wasalam had it worse. Yet, he sallaAllahu ‘alayhi wasalam always was, is and forever will be, the most beloved to Allah and the Dua’a at Ta’if affirms why.